The Turquoise Table: Review, Excerpt, Giveaway! When I set my summer reading list, it included The Turquoise Table, a new book by Kristin Schell. I no longer remember how I stumbled across this book, but I’m glad I discovered it. It was a combination of inspiring and troubling – in the best ways. As the book begins, Kristin Schell is concerned by her busy life and the way that screens seem to have taken over her family’s attention. She remembers being a student in France and the slower pace around that family dinner table. She wonders how she can live into the call of Romans 12:13, “Take every opportunity to open your life and home to others.” She longs for a simple life of hospitality, and yet she is a suburban mom with a full calendar, a less-than-perfect house, and four active children. And then, due to a combination of choice and circumstance, she ends up with a picnic table in her front yard. At first it is deposited there temporarily during a delivery meant for the backyard. But as soon as she sees it, Kristin realizes that a front-yard picnic table is the answer to her longing to live God’s love with her neighbors. She paints it bright turquoise and starts spending time at it regularly. She discovers she can invite people over to share lemonade or coffee without wondering if her house is clean. She meets neighbors that she never knew as they walk their dogs or simply walk the neighborhood. She unexpectedly starts a movement of “Front Yard People” as other Turquoise Tables spring up around her community and a social enterprise starts custom-building them to order. What troubled me about this book was how evident it made the spiritual poverty of the materially privileged. I was taken aback by the first two sentences: “My love affair with the table began with an F in high school French class. The failing grade prompted my parents to send me on an overseas immersion experience in France…” Really? If one of my kids came home with an F in French class, spending the money to send them to France would be the last thing on my mind! But what inspired me is Kristin’s sincerity in her search for a life that matters. She takes action to reverse the culture of loneliness and individualism that often takes hold in the suburbs. If Mother Theresa is right and the spiritual poverty of loneliness is greater than material poverty, Kristin shows a simple and effective way to break free of that spiritual poverty. After I read it, I wanted a Turquoise Table in my front yard too. This book is beautiful. It’s a hardback with full-color images, recipes and stories and ideas from Turquoise Tables across different neighborhoods. There’s even a ribbon to mark your spot. And we’re giving one away – the review copy I received! Get a flavor of the book by reading the excerpts below, then enter to win by following the instructions at the bottom of this post. When you sit at the Turquoise Table, make sure all people feel welcome, no matter how young or old, no matter their mother tongue or attire, regardless of race or religion. Invite them to sit awhile. 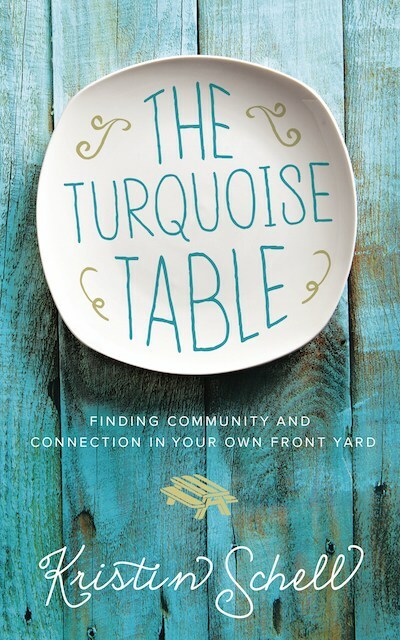 Would you like to sit with Kristin Schell and read the story of the Turquoise Table? Enter to win our giveaway! Just go over to our Facebook page, find the post announcing the giveaway, and leave a comment on it letting us know if you would actually consider putting a Turquoise Table in your own front yard. Make sure you like our Facebook page as well! This giveaway will close Friday morning, June 16th, at 7am, at which time a winner will be selected at random and contacted through Facebook Messenger. The winner has 48 hours to claim their prize by providing a postal mail address. Once the prize has been claimed, the Facebook post and this post announcing the giveaway will be updated to reflect that the giveaway has closed. What other giveaways would you like to see here on Grow Christians? I have one in my back yard! I live on the 10th floor of a 20 story condominium tower. Any suggestions for how I could adapt this splendid idea to my circumstances? That is a great question! There are a couple of suggestions in the book for “Turquoise Tables in unusual places” but I don’t think any of these exactly suit you. Does your church have room for one? Our Church (St. Mary Magdalene, Toronto) is not a good location for a Turquoise table as it has very little lawn and is right beside a municipal parkette. It is also a 35 minute drive from me. Thanks for the suggestion though!